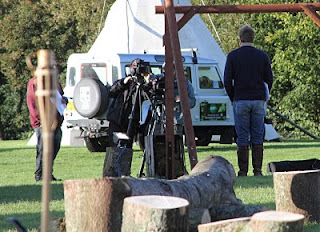 Forest of Dean Wildlife & Nature Diary: Base Camp Eden 2010 - With Ben Fogle! What a weekend we have had! After winning a photo/conservation competition, my family and I spent the whole weekend with Ben Fogle and a film crew, filming the first ever Base Camp Eden! The setting was the Royal Forest of Dean, where I live and even though we know the forest like the back of our hands, it did not take away any of the excitement and the weekend will be one, which we will all remember for the rest of our lives. I have already written a full page article for my Wildlife and Nature Column that will be coming out later today. I will upload this feature tomorrow to give you an insight into what we all got up to on this amazing weekend. Ben Fogle is one of the nicest people you could ever wish to meet and I thank him and everyone else behind the scenes for everything they did, to make this adventure very special. Labels: "base camp eden 2010", "ben fogle", "eden inspires", "forest of dean"